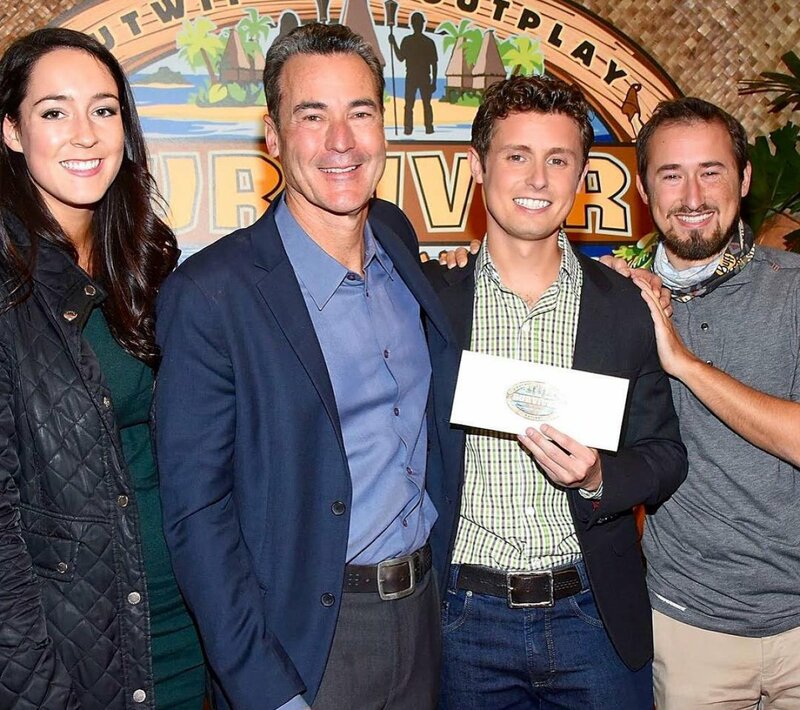 Adam Klein was crowned the winner of Survivor: Millennials vs. Gen X during the live portion of Season 33's finale broadcast on CBS from CBS Studio Center in Los Angeles, CA. Adam, a 25-year-old homeless shelter manager from San Francisco, CA, won Survivor in a clean-sweep jury vote and therefore took home one million dollars. He played the game to bring joy to his family while his mother and best friend was home battling Stage 4 lung cancer after multiple failed treatments. Adam defeated Ken McNickle, a 33-year-old model from Denver, CO, and Hannah Shapiro, a 24-year-old barista from West Hollywood, CA, in the season's final jury voting results. Neither Ken or Hannah received a single jury vote. During an exclusive interview with Reality TV World on Thursday, the day after the finale, Adam talked about his Survivor victory. Below is the concluding portion. Click here to read the first half. Reality TV World: Hannah Shapiro seemed to think you liked taking credit for moves that were hers. What's your response to that? Would you say the only moves she was responsible for were the rogue ones you ultimately disagreed with? Adam Klein: No, and she brought this up at Final Tribal Council -- except it didn't make the air -- but she said a few times, "Adam is taking credit for my moves," and I reiterated at Final Tribal Council, "No, I am not taking credit! I do not want credit for many of these moves!" I agreed that Hannah put every single person on the jury there, but sometimes, those decisions made it more difficult for us to actually get to the end. Voting out [Bret LaBelle] is a great example. I think another example is that she was instrumental in turning [David Wright] and [Zeke Smith] against each other. And while that was a good idea, it was one vote too soon, because we had an alliance of six and there were only 10 people in the game. And so, we lose one person and now, all of a sudden, we're at a rock draw. I think she was partially responsible for causing that divide within our alliance and creating the situation that ultimately led to a rock draw that could've sent any of us home. So, you know, there was a lot to recover from in terms of some of the moves that she decided to make. Reality TV World: How shocked were you to find a hidden Immunity Idol right before the Final 5 Tribal? Because David seemed to think there were none out there. Reality TV World: Yeah, if there was an idol out there, I didn't necessarily feel like I needed it for myself. But the most important thing was to keep it out of Dave's hands. That's why I went looking for it, just to make sure that Dave wouldn't find one. Because again, I thought I had three votes locked up and the only thing could ruin it would be Dave finding an idol. And, you know, he's got an eye for those things. I'm thankful that he presumed there wouldn't be one out there, and I think my idol finds might be the latest idol find in Survivor history. I don't know if anyone has found one on Day 37 -- in the afternoon of Day 37 -- and played it that evening. It was basically like finding Individual Immunity, because I had to play it at that Tribal Council. Reality TV World: Going back to when Justin "Jay" Starrett was still in the game, did you believe that he would actually honor his promise to take David and yourself to the Final 3? You discussed it while on that steak Reward together. Adam Klein: I don't know if he would've decided to take David to the end, but I 100% believed at the time -- and still do -- that Jay would have taken me to the end, because it made sense for him. He would have beaten me, most likely, or almost assuredly at Final Tribal Council. So, it made sense for him, but it wouldn't make sense for me. Because I knew that I would lose. So, you know, it just wasn't an option for me like it was for him. Reality TV World: When did you find out David had created Jay's fake hidden Immunity Idol? And what was your reaction when you heard about it? Adam Klein: I found out at Tribal Council, and I was so, like, I went into that Tribal Council feeling sad that I was about to vote out someone whom I had grown to love and respect and that I knew was doing this for his family as well. But I had to make that decision for my game, so I was sad going into it. But then, it turned into the most hilarious Tribal Council I have been to, where he plays this thing and David made it and Jay was such a great sport about it. And then Ken actually reached into the fire to try to pull out the idol because he wanted to give it to Hannah as a souvenir. I was like, "What is going on here?!" And then he sat back down and then he stood up again and pulled the Legacy Advantage out of his boot! He's taking his shoes off and I was like, "What is going on at this Tribal Council?! This is supposed to be, like, a very straight-forward [vote]." We vote out Jay and I had no idea what was going on in terms of all these fake idols and Legacy Advantages or whatever, but sure enough, it ended up being just as simple as I thought it was going into it. There was just a lot of hilarity along the way, and Jay exited in one of the best ways I've ever seen on Survivor, with a huge smile on his face, laughing on the way out. We went back to camp full of smiles with how great of an exit Jay had. Reality TV World: On the topic of idols and advantages, was your decision to not use your Reward Advantage during the loved ones' visit truly sincere because you didn't want to rob anyone of that time with family or was it a strategic choice? Because you ended up giving the advantage to Jay, which mended your relationship. Adam Klein: Right. It was both. It was absolutely both. And that's the key to this game, is that you are dealing with real people with real human emotion and real feelings. And, you know, I was never going to do anything intentionally to put my game in jeopardy, but you also are living with these people and becoming very close friends with them. So it absolutely was both, but I had a good feeling that I may be taken on the Reward after doing something like that. So I certainly thought about that, and it was part of my decision-making in terms of figuring out, "How do I play this thing without it blowing up in my face?" Because it can be more of a disadvantage than an advantage, but I think I found the right way to play it in a way that was true to myself as the person that I am and it helped me in the game. Reality TV World: You revealed you want to donate $100,000 to lung cancer research, which is amazing. Do you have any big plans for the rest of your winnings? Adam Klein: So, yeah, I'm going to be donating $100,000 to "Stand Up to Cancer," to the lung cancer dream team, and if other people want to make a donation as well, it would mean the world. The link to donate is www.sutc.org/survivor. As for the rest of the money, a lot of it is going to be paid in taxes and then whatever is left is going to allow me to continue to live the kind of life that I want to live, which is working on issues that I find meaningful and continuing to work in the non-profit world and trying to help other people as much as I can. I don't necessarily make as much money as I would if I worked for a for-profit company, but having this money will allow me to live the kind of life I want to live while not worrying about myself as much financially. To read the first half of Reality TV World's exclusive Survivor interview with Adam Klein, click here. Amanda Stanton and Josh Murray allude to break-up on social media, source confirms it's over due to his "temper"